My family has a history of having lived in India for four, or possibly 5 generations- they were all Railways people. Both my grandmother and great grandmother were buried in Bhusawal. My father Leslie Nixon, was born in Agra in 1925, schooled in Mussoorie, trained with the Gurkhas and joined KGV’s 1st OGR (King George V’s regiment). He worked during the Partition to transport refugees in and out of the Gurkha head quarters in Dharmsala (then Punjab territory, now in the independent state of Himachal Pradesh) to and from Pathankot, Punjab, by train. 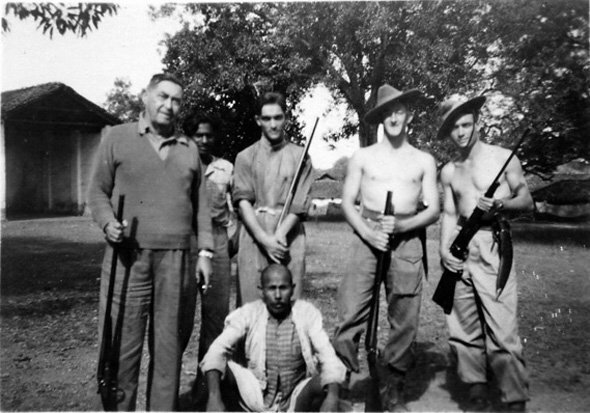 This photograph was taken at Jabalpur, Madhya Pradesh in 1946 . Behind them was an empty elephant stable. I like this photograph because it is at variance with the way the British in India were depicted on Shikar (Game hunting). This was an ordinary Anglo Indian life away from the metropolis and now there is very little to be seen of it. My father, aged 22 then and his friend Rob May were very young and had to take on an enormous responsibility and an almost impossible task during partition in protecting refugees. He, like millions of others, was left deeply affected by it . My father archived all of the family images in India and thanks to him I have been lucky to have a ‘bird’s eye view ‘ of partition. He kept a lot of old army documents and memorabilia from the few years he served with the Gurkhas. When he migrated to Australia he went to University and became a Geologist. He has been very interested in my own Phd thesis which focuses on the ‘experience of domiciled Europeans and Anglo Indians up to and during the Partition‘ and sometimes the memories have been painful for him. I am planning on visiting India again later this year to do more research I think your project is absolutely remarkable I read about it in ‘The Australian‘ newspaper and thought I had to try and get a picture in although my family were not Indian they were a part of India!